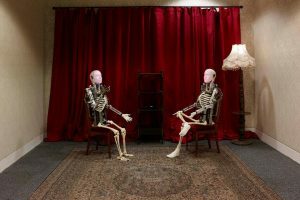 Talk (2016) is a work by Swedish artist that consists of two humanoid robots seated in chairs facing each other. The robots comprise of skeletal bodies with metallic moving arms, their faces are animated as they engage in a lively conversation. ‘I do not know who I am’ states one robot ‘it got worse after a dream I had’. Thus starts a reverie between the two about the nature of dreams, selfhood and consciousness: ‘what am I? Just bloody brain function…I feel reduced….I experience myself as a multitude’. As they talk the robots exhibit humanlike traits such as memory, hesitation and humor, they even stop their conversation as audience members approach, to ask if they could please be quiet and not interrupt. Talk presents the robots as self-organising, dreaming, sentient beings that function without, and perhaps in spite of, human intervention. The work performs an alternative vision of robot beings and AI that is not rooted to ideas of human advancement, enhancement or to the performance of functional tasks, increased productivity and efficiency. Instead these are machines that are troubled and confused by their own existence, they are self reflective and doubtful about their subjectivity. The artist creates a space of critical reflection about techno-scientific acceleration, the work asks questions about the nature of human and nonhuman agency in a highly ‘indoctrinated’ posthuman world. 4 Comments on "Tove Kjellmark, Talk, 2016"
Thank you Tove for bringing this piece of work to my attention! I think of it as a sort of meta reflection making the viewers think about their own subjectivity and being, maybe also reflecting on their multiple becomings? Hey sorry, I was so swept away by Tove’s work that I wrote Tove instead of Helena! Thank you HELENA for bringing this piece of work to my attention! I think of it as a sort of meta reflection making the viewers think about their own subjectivity and being, maybe also reflecting on their multiple becomings? This is one of those delightful works of art that makes humans question what makes us so darn special? Why would anyone want to be our robot overlords? Thanks, Tove! Love the piece, and want to see it in person now. It is a pleasure to hear your readings of the piece. Thank you!